Archery season is almost here, which means you and your buddies need new memes. The excitement is in the air for bowhunting. Get a few laughs in before opening day and relate to these painfully true memes. 1. 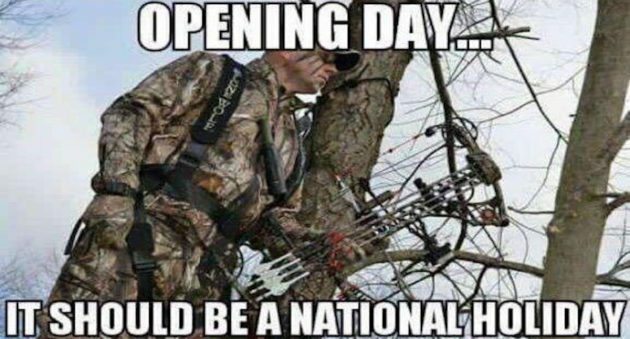 Opening Day should be a national holiday. Let's face it, you're probably taking the day off anyways. But it would be nice to save another vacation day for the rut. One more month until October, we can do this. We can all hope for perfect leaves like this. Another day in the books. What do they say? There are two seasons: deer season and waiting for deer season. The sweltering heat can leave any day now. The six simple steps to a healthy lifestyle. Last year was warm. We can all hope for a nice, crisp fall. In a committed relationship with bowhunting. Hunters would probably be millionaires. Which is your favorite meme? Be sure to share it with your hunting buddies for a great upcoming hunting season.